Here are a few of our favorite places to see in Oahu. One of Oahu's natural wonders, Hanauma Bay is a world-class nature preserve and home to a huge assortment of sea life from colorful rainbow parrotfish, convict tangs, trumpetfish, mullet, squid and living coral reefs. Hours: Closed every Tuesday and open from 6:00 a.m. to 7:00 p.m. the rest of the week. Directions: Take Kalaniana'ole Highway east from Waikiki for approximately 10 miles. Entrance to the preserve is on the right. Parking: There is a $1 parking fee and $3 admission fee for non-residents. The parking lot fills up rather quickly, so if you are not there early, you may not be able to get in until the early arrivals start leaving. -Visitors are required to watch an educational film about the bay, the marine life and the preserve prior to going down to the beach. Directions: From Waikiki, take H1 West to H2 North. Continue to Kamehameha Highway (99). 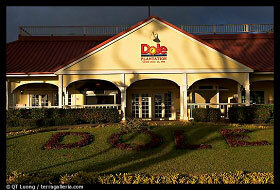 Dole Plantation is located at 64-1550 Kamehameha Highway. Approximately a 40-minute drive from Waikiki. Located offshore from Kailua, are "Na Mokulua" bird sanctuaries, commonly known as the "Twin Islands" - larger Moku Nui and tiny Moku Iki. Travel to island by kayak. We rented Kayaks from Two Good Kayaks ( www.TwoGoodKayaks.com ). There is a discount from the Entertainment Book. The no.1 beach in Oahu. 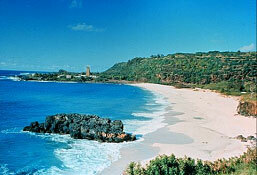 Known for it's fine sand and it's beautiful turquoise waters. This beach isn't as crowded as the other touristy beaches. Half a mile of sparkling sand, palm trees that sway over a white beach, lush tropical plants and endless sunshine make Lanikai one of Hawaii's most scenic beaches. The shore is protected by a nearby coral reef, which keeps the surf relatively calm, and the water is always a deep turquoise or green. 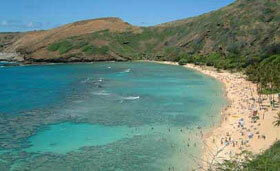 Visitors to Lanikai can kayak to the nearby twin islands of Mokumanu and Mokulua, both noted bird sanctuaries. 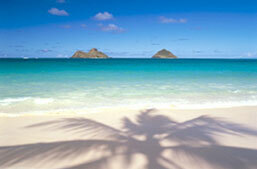 Lanikai not only seems postcard-perfect … it truly is! Directions: To get here from Honolulu, take Hi. 61 (Pali Hwy.) into Kailua. Follow the street (which becomes Kailua Rd., then becomes Kuulei Rd.) until it ends. Turn right on Kalaheo Ave. (which will become Kawailoa Rd. in a few blocks). Follow the road over the canal. At the stop sign, turn left on Kaneapu Place. At the fork in the road, bear left on the one-way Aalapapa Dr. Turn right at any cross street onto Mokulua Dr. 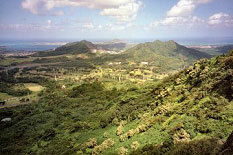 Located at Nuuanu Pali State Park, the lookout overlooks the 985-foot cliffs of the Koolau Mountain Range. (Translated, "pali" means "cliffs.") And yes, it is extremely windy. The trade winds blow through the valley between the high mountains on either side, forming a strong wind tunnel of sorts. On extra windy days, you can even lean into the wind and let the gusts hold you up. Directions: Take the H1 freeway (eastbound) from Waikiki, then take the Pali Highway, Route 61 via Nuuanu Pali Drive. Follow the signs to the lookout. Directions: Off Kamehameha Highway on the North Shore in the Waimea area. 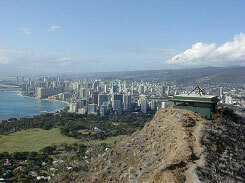 The most famous volcanic crater in the world is Diamond Head, located on the South-east Coast of O'ahu at the end of Waikiki overlooking the Pacific Ocean. The crater is 3,520 feet in diameter with a 760-foot summit. There are two sets of stairs, one with 99 steps and the other, 76 steps. There is also a 225-foot unlit tunnel. The hike is classified as easy to moderate in exertion but is certainly worth the breathtaking, unparalleled view of the entire west side of the island, from Waikiki to Koki Head. The trail is 1 ¾ mile and takes about 1 ½ hours. There is NO shade during the hike, so you may want to go early. Bring water for the hike. Bathrooms are available at the trailhead. From Waikiki go east along Kalakaua to the intersection with Monsarrat Avenue at the Honolulu Zoo corner. Turn left onto Monsarrat and proceed 1 ¼ miles until the road becomes Diamond Head Road. Follow this road for ¼ mile to the access road to the crater. Go through the tunnel into the interior of the crater and proceed to the designated parking area. Today, visitors come from around the world to see the USS Arizona Memorial, which spans the mid-portion of the sunken battleship. The national memorial is designed to encourage quiet contemplation, and to appeal to our memory and sense of sacrifice. 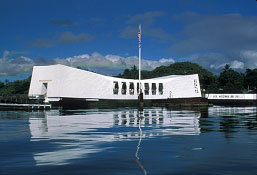 Interpretive programs, including a documentary film about the attack on Pearl Harbor and the boat trip to the USS Arizona Memorial, begin at 8:00 a.m. (7:45 a.m. in summer). The last program each day begins at 3:00 p.m. Tickets are issued on a first come, first served basis. Visitors should expect crowds. Daily visitation to the park is about 4,500 people. Strict security measures prohibit purses, handbags, fanny packs, backpacks, camera bags, diaper bags, luggage and/or other items that offer concealment. Visitors may bring a camera and cam-recorder. From Waikiki : Take Ala Moana Blvd. / Nimitz Highway or (H-1) West to begin. While on H-1; look for the USS Arizona/Stadium exit, #15A. DO NOT TAKE THE PEARL HARBOR EXIT. Continue on HI-99 (Kamehameha Highway) and turn left at the 4th traffic light onto Arizona Memorial Place. At the base of the hill turn right and the parking lot is on the left. From Kapolei: Take Interstate Highway 1 East (H-1) to begin. Take Exit #13A toward Aiea onto Moanalua Road; stay in the far right lane and take the Stadium/Aiea Exit. Continue on Moanalua Road and turn left at first stoplight onto HI-99 East (Kamehameha Highway). Continue on HI-99 (Kamehameha Highway) and turn right onto Arizona Memorial Place. At the base of the hill turn right and the parking lot is on the left. From Kaneohe/Kailua: Take Interstate Highway 3 West (H-3); take Exit 1C towards Halawa/Camp Smith/Aiea/Stadium; turn left on Kahuapaani Street. Follow signs for Stadium/Honolulu. Turn right on Salt Lake Blvd. Continue following signs for Stadium. Turn left on HI-99 East, also called Kamehameha Highway. Continue on HI-99 (Kamehameha Highway) and turn right onto Arizona Memorial Place. At the base of the hill turn right and the parking lot is on the left. From North Shore: Start on HI-99 and continue on HI-80. Continue on HI-99 South. Take I-H2 South toward Honolulu. Head toward Honolulu and take Exit #1A onto Interstate 1 East. Take Exit #13A toward Aiea onto Moanalua Road; stay in the far right lane and take the Stadium/Aiea Exit. Continue on Moanalua Road and turn left at first stoplight onto HI-99 East (Kamehameha Highway). Continue on HI-99 (Kamehameha Highway) and turn right onto Arizona Memorial Place. At the base of the hill turn right and the parking lot is on the left.